Prior to 1935 when St. Ann was given to the care of the Fathers of the Divine Word, priests from St. Augustine Seminary in Bay St. Louis assisted Father Sorin, who served the area missions for over 40 years. In 1937, Father Reinalt, who had been serving St. Ann, sent a detailed report on conditions at the Lizana mission, and stressed that a new church was necessary. 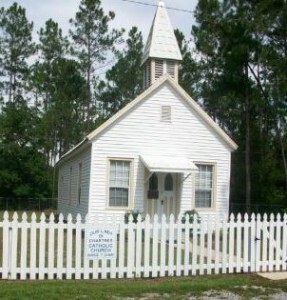 The old frame church had fallen into a terrible state of disrepair, so a new and more convenient site was chosen. On August 6, 1937 , Bishop Gerow purchased a lot on Highway 53 for $75 for the new church building. 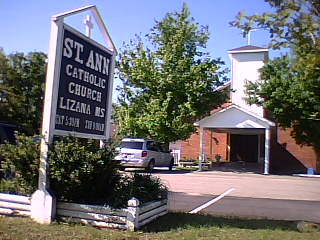 July 17, 1938 , the bishop blessed the new church of St. Ann at its present location in Lizana. Father Francis McCollum from Nativity Parish in Biloxi had charge of the mission, and it was intended that as soon as possible he would take up his residence as the first pastor. But on March 12, 1939, Father McCollum died suddenly following surgery. Father Francis Waters was sent to Biloxi to serve the Lizana community until a rectory could be built. Father Waters took up residence at St. Ann as the first pastor on August 12, 1939 . He also served Vidalia (Dedeaux), Perkinston Junior College and Wiggins. In the fall of 1946, Father Waters was able to obtain two Dominican Sisters from New Orleans to teach at Lizana Elementary Public School with the blessings of the county school authorities. As the years passed, several more sisters came and were able to stay for about 20 years. Their influence in Lizana is still remembered to this day. of 1988 that parish hall was remodeled into eleven beautiful CCD classrooms. On December 3, 1988 the new parish hall was blessed and dedicated by Bishop Joseph Howze. The current hall is divided into two sections, one meeting room (the “North Room”) and the main room. It also has a large modern kitchen. St. Ann’s Parish accepted responsibility in 1972 for the mission church on Big Creek Road , Our Lady of Chartres. Until that time, Our Lady of Chartres had been served by The Society of St. Joseph.